Yesterday, I shared a journaling card holder I made as part of my Weight Watchers challenge to overcome emotional eating. I thought I would share how I put together my design. First, I used the Stampin’ Up! Envelope Punch Board and followed the measurements listed using a 6″x6″ piece of paper. (I did not score the final line). Then I folded it and applied adhesive to seal the 3 sides. (See the lines where adhesive was applied). I chose to add a 1″ belly band and finish with ribbon. I defensively had some fun, playing with some retired paper. This size would also make a great gift card holder with 3″x5″ note. Check out a quick video here. 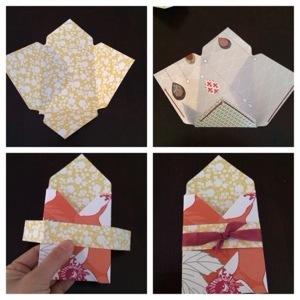 This entry was posted in Gift Card Holder on February 18, 2014 by katzcreates.